I See Some of My Favorite Drawings… In Person! My mom turned 70 on January 22, and she decided she wanted to celebrate by visiting the North Carolina Museum of Art (specifically the Norman Rockwell exhibit). 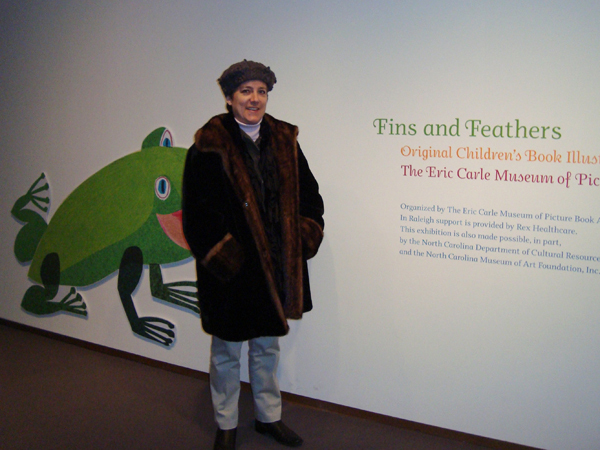 I was thrilled to discover that in addition to the fabulous Rockwell works, the museum is playing host to the work of some of my very favorite picture book artists too, on loan from the Eric Carle Museum of Picture Book Art. I got to see drawings from Tedd Arnold, Arnold Lobel, Leo Lionni and several others (and if you’ve visited my favorite books page, you know I think these guys are wonderful!). I can promise you this was truly a thrill–and I recommend it to anyone who loves children’s picture books. The exhibit is up through Sunday, January 30–if you’re near Raleigh, go check it out! It’s FREE–no ticket required!